Buy Rizopia Organic Gluten Free Brown Rice Elbows in the UK from our online shop or directly from our independent Scottish store. Rizopia organic, gluten free elbow shaped pasta, often called macaroni pasta, is made up of small hollow tubes ideal for holding tasty Italian sauces. Perfect for cold pasta salads in picnics and lunches. A pub favourite, but with a healthy twist This recipe contains 250g gluten free Macaroni. We sell real Rizopia and other Gluten Free Pasta directly from our shop in Scotland and online throughout the UK. View more products from Rizopia. Where can you buy real Brown Rice Elbows safely online? If you are wondering where you can buy Rizopia Organic Gluten Free Brown Rice Elbows safely online in the UK, then shop with us. We are an actual health foods shop; with real people selling real foods and products. Our award-winning independent shop is located in Stirling, Scotland since 1976. You can buy our Gluten Free Pasta in store or safely place an order with us online or over the phone. 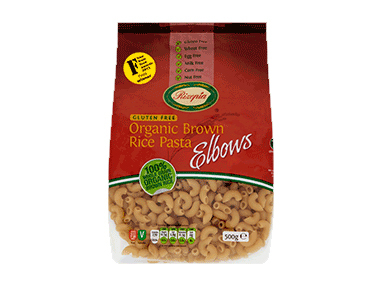 Brown Rice Elbows - Rizopia Organic Gluten Free Brown Rice Elbows in Gluten Free Pasta and Dried Pasta.